This year's special exhibition in the Abegg-Stiftung presents astonishingly well-preserved and colourful textiles from Egypt that are between 1'200 and 1'800years old. The decorations on these textiles, in particular afford us a wealth of insights into the craft skills of the time. The exhibition shows large painted hangings, advanced silk fabrics with playful patterns, and tapestries - some of which were meant for everyday use, while others are most sumptuous and must have been very rare. The brush, shuttle and ball of thread were among the most important utensils in textile production. They stand for the different techniques represented in the exhibition. Most of the large wall hangings were tapestry weavings. They reveal the luxurious décor of rich town houses and rural villas. The mythological figures and personifications of classicism were still popular depictions in late antiquity. Many textiles were not fully patterned buit had defined pattern areas. The threads that formed the pattern were mainly applied here by hand using a ball of thread, in other words they were woven in the tapestry technique. Thread was made of wool, linen and silk and was sometimes even wrapped in very thin gold foil. 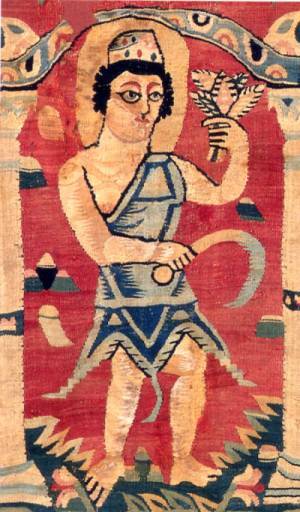 The tunic, the most common garment of the time, was largely unpatterned but had a strict system of decorations, which were usually woven together with the rest of the fabric. 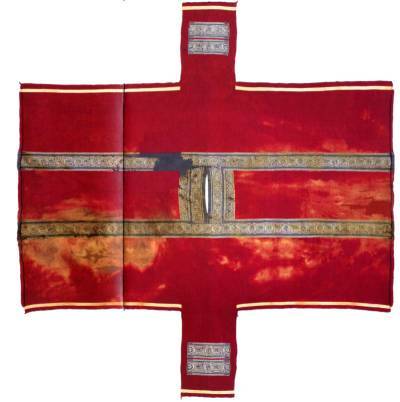 The tunic was bound into the loom or frame, as shown here, and was woven from sleeve to sleeve.